It feels like a lifetime ago that Sideshow Collectibles announced their trio of Hulks to be released. The end of 2013/early 2014 we started to see previews and stories for the Sideshow Collectibles trio of Hulk premium format figures. I have to say that Geo and I were really excited to hear this news. Then, back in early 2014 the Sideshow Collectibles Hulk trio came up for pre-order. To me I felt the previews of this piece looked very promising and I had to get a green Hulk for my collection, no questions asked! And Geo went straight in for the Red version. The Red received a range of views from very good to very poor.. It seemed that sideshow took this on board as the green was delayed until now (17 months after it went up for pre-order). 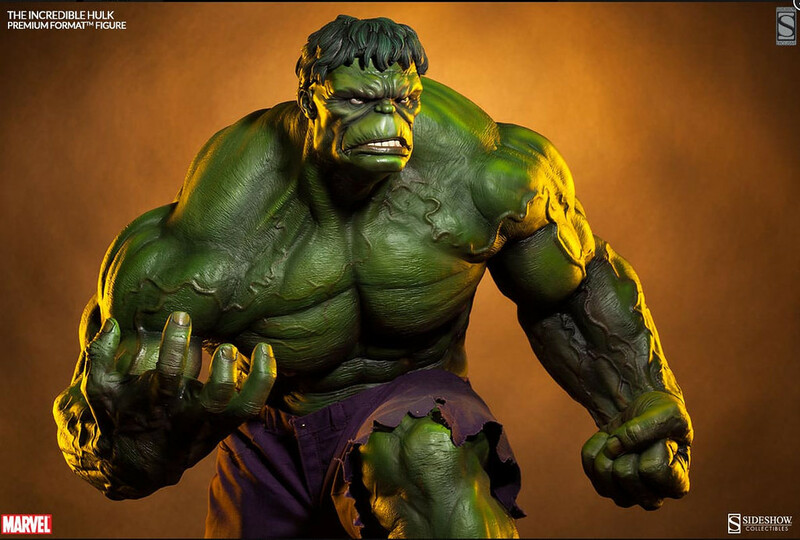 But with rumors of Sideshow using cheaper factories, using two factories for the new green hulk (one for the head and one for the body), resulting in color mismatches and ill fitting head and even not sticking to the measurements given on the website to make the trio of Hulks appear different has been shown to be false (will cover this in another story or I will side track). As I am waiting to receive my Green Hulk that was shipped 22nd September we will not be able to give our in hand review yet, but the views on social media have had me close to cancelling. The constant stories of the head and body looking like they came from different factories, with heads that do not fit the bodies well, have poor joining lines and are in different colors has got me worried. There have not really been any stories of the statue being light, but after seeing a few images of a statue that was damaged in shipping the thinness of the materials used has also sent a shiver down my spine. It has got me nervous, but it is too late to stop Sideshow sending out the piece already. So we will see… By the the the counter reaches zero my Green Hulk should be in hand and our full unboxing should be for all to see on YouTube.. Please pray to the statue Gods for me..